Scones! 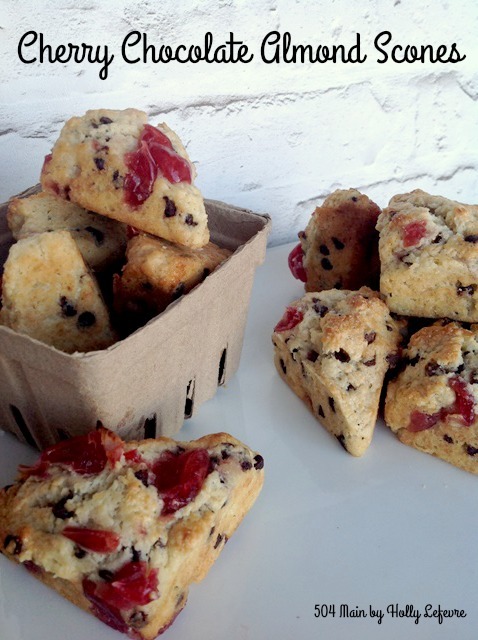 Scones! Scones! You are chanting that, right? 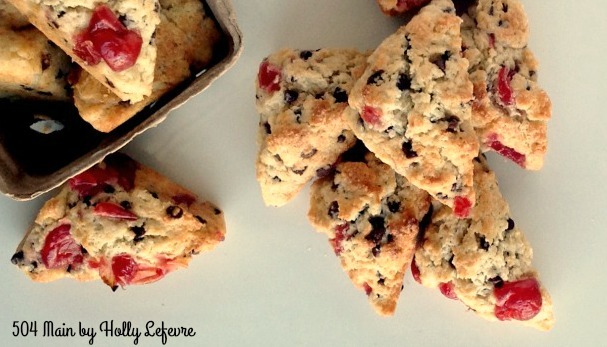 A favorite breakfast treat is scones. I admit I usually do not make them from scratch, but this was a special occasion and I wanted to try making some with some of my family's favorite flavors - cherries, chocolate and almonds! Man oh man they baked up just perfect and tasted even better. These scones would be amazing with tea, coffee or just because and best yet, you can play with the ingredients to suit your tastes! Why wait a moment longer ...lets move onto the recipe and then you can surprise your family with a breakfast treat this weekend! Freeze your butter over night. Mix together flour, sugar, baking powder, baking soda, salt. Use your hands (be sure they are clean!) to mix the butter into the flour mixture. Pinch and rub and smush with your fingers until combined. Mix in the mini chocolate chips. Mix the egg and sour cream together. 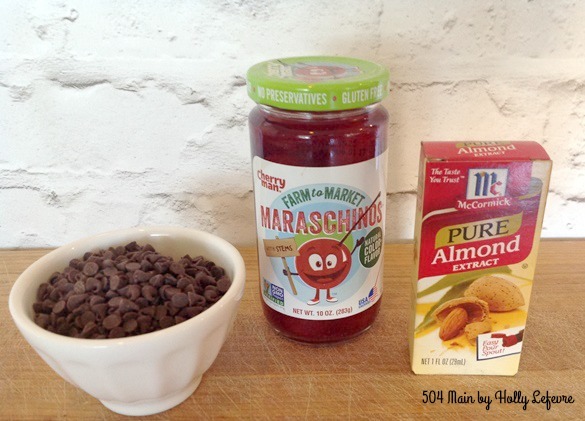 Add the almond extract to the wet mixture. Add the wet mixture to the dry mixture (do not use a mixer. Use a fork). If necessary, use your hands again to help the dough form. Gently fold in the chopped cherries with your hands. 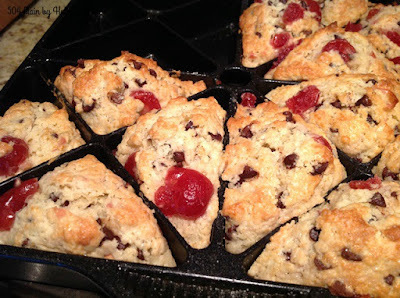 NOTE: Not all of my cherries folded into the dough, so after forming the scones (before baking), I stuck those cherries into the scones individually. My dough was still a bit wet, but I was using my mini scone pan, so it was OK, because I was placing the batter/dough (2 Tablespoons) into the mini scone pan, so it was easy to handle. Use a large cutting board or pastry board and dust with flour. Place your dough on the board and form a large circle about 3/4" thick. NOTE: add a bit of flour, 1 Tablespoons at a time to make the dough easier to work with. Use a circular cookie cutter to cut scones or pinch off biscuit size piece and pat into a (rough) circle. Serve to your favorite people! Like baked goods? 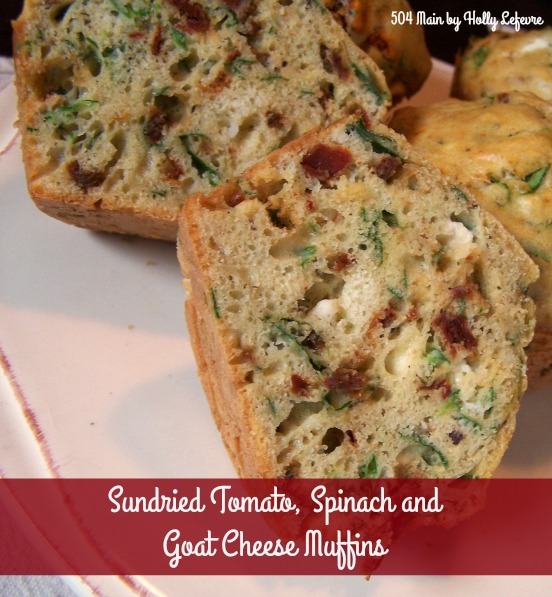 Try a savory delight with these Sundried Tomato, Spinach and Goat Cheese Muffins. I still haven't made it to the store to buy cherry pie filling, so I'll add maraschino cherries to my list. My husband expects scones to be sweet(you know like a cookie), so he always thinks something went wrong when he tastes a scone. I, on the other hand, love scones, especially with a cup of Earl Grey! 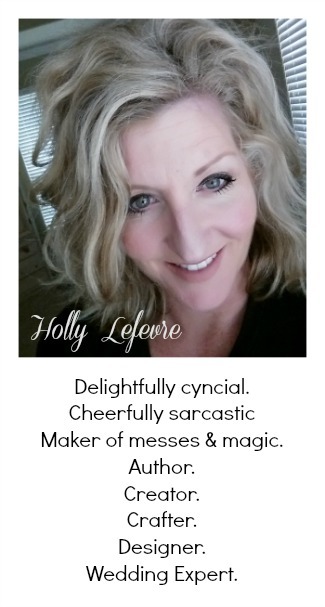 I will make the sonces for myself and my girls(daughters and grands). Thanks for sharing the recipes!